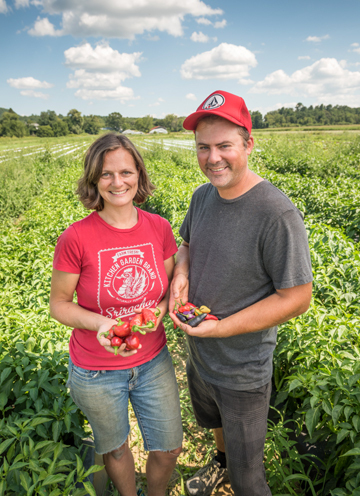 In 2013, she and her husband/business partner Tim Wilcox decided to try making something different with the peppers from their organic farm. Each September they organize a spice lovers’ weekend called Chilifest. That year they added a new feature to Chilifest: their own Sriracha. 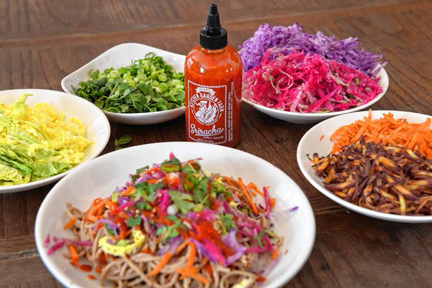 Originating in Thailand, Sriracha is a chili sauce that has taken the country by storm in the last couple of decades. Kitchen Garden’s version is special, Caroline Pam informed me. “It has a completely different flavor when it’s made from peppers that are fresh and are fermented the way we do them,” she explained. She is far from alone in seeing the merits of the farm’s Sriracha. 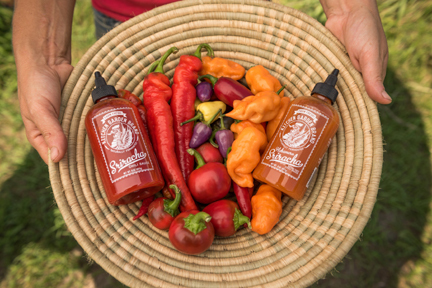 In late January Kitchen Garden’s sauce won a coveted Good Food Award in the “pantry” category. “We seek to highlight businesses in all parts of the U.S. who are making products that are tasty, authentic, and responsible,” Jessica told me. This past year 2059 entries were submitted from 38 states. Only 291 products received awards. I asked about the process of making the sauce. During the harvest season, Caroline told me, the farm picks 3000 pounds of peppers each week. 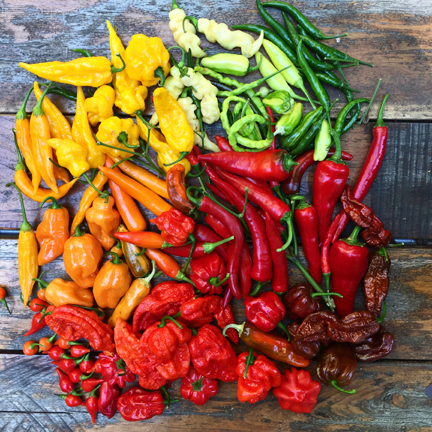 “We fill up our box truck with hand-picked peppers,” she explained. The peppers are taken to the Western Massachusetts Food Processing Center in Greenfield. The next day, they are washed, stemmed, and ground. The peppers then go through two stages of fermentation, a process that takes weeks. Eventually, the pepper mixture is cooked and milled; then the pepper pulp is heated with vinegar, bottled, and sealed. The Sriracha—like the salsa Kitchen Garden Farm also produces—is shelf stable but must be refrigerated after opening. In their first year of Sriracha production, Caroline and Tim put up 400 bottles. The following year (2014) they ended up with 4000 bottles. Their haul for this past year was 32,000 bottles from 18,000 pounds of peppers. The sauce is sold in stores and is also available from the Kitchen Garden website, www.kitchengardenfarm.com. It is popular in restaurants throughout the northeast. “It’s fun to see how people are using it,” said Caroline. She and her husband stagger the production of the sauce through the fall and early winter months. Picking can take place only in the warmer months, but bottling ended in the winter. At this time of year the two farmers are still harvesting; they produce hardy greens and root vegetables in their high-tunnel greenhouses. They are also busy planning for the coming season. Kitchen Garden was founded in 2006 “with just one acre and a rototiller,” Caroline told me. The 2017 season will be the first in which their now 50-acre farm will operate exclusively on a wholesale basis. Caroline noted that she will miss seeing customers at farmer’s markets. “It was a really hard choice, but we’re responding to what the farming opportunities are,” she said. Consumers will still be able to find Kitchen Garden’s range of organic produce at local markets. And the farmers will be on hand for this year’s Chilifest, scheduled for September 16 and 17. Caroline Pam and Tim Wilcox are both passionate cooks. In fact, Caroline attended culinary school in New York City. The two use their Sriracha in a variety of dishes. “It complements everything else that we’re growing. It’s really just so good with everything you can cook,” Caroline enthused. I asked her for a recipe that involves the Sriracha—and she shared the noodle formula below. “In my first apartment, when I was 18 years old, a vegetarian, and new to cooking, I made this at least twice a week,” she said. “The recipe has evolved somewhat since then, but the basic concept is the same: noodles, peanut sauce, fried tofu, and raw vegetables. Caroline was kind enough to send me all three types of Sriracha so I could test the recipe with my family. The classic Sriracha was our favorite—just enough heat to lend kick to the noodles. The habañero flavor was quite a bit hotter—and the VERY hot ghost pepper version offered initial sweetness followed by a little burn. I have no doubt we’ll manage to finish all three eventually! We changed the recipe a bit to suit what we had in the house, blanching asparagus instead of broccoli and substituting leftover chicken for the tofu. (Some form of egg might also be nice.) I will definitely make this recipe again; I love peanut sauce. Here’s what our spread looked like. Boil the pasta until it is al dente; then drain and rinse it in cold water to stop the cooking. Toss it with a little sesame oil and set it aside. In a medium-sized bowl, mix together the sauce ingredients, adding hot water as necessary to achieve the texture of thick and creamy salad dressing. For the fried tofu, cut the tofu into thin (1/4-inch) slices. Put the soy sauce in a small shallow bowl or saucer. Dip the slices on each side briefly and fry them in hot oil until crispy, turning once, as you would fry bacon. Drain on paper towels and chop coarsely into bite-sized pieces. Put the tofu in a serving dish on the table. Prepare the rest of the vegetables and herbs and arrange them artfully on the table so that diners can serve themselves. Lubricate with Sriracha as needed. Serves 4 to 6. Here is Caroline’s version of the dish. 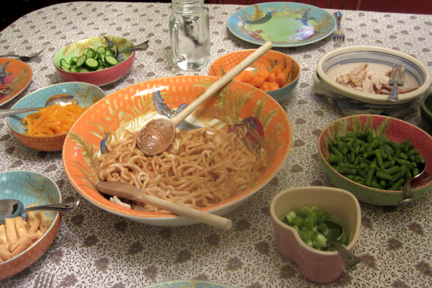 Note that she julienned her veggies to make everything even and gorgeous. This entry was posted on Tuesday, April 11th, 2017 at 4:00 am	and is filed under Condiments, Farms, Farm Stands, and Farmers Markets, Pasta and Pizza, Vegetables. You can follow any responses to this entry through the RSS 2.0 feed. You can leave a response, or trackback from your own site. Happy Spring! They are one of our farmers market favorites. Winner! I could eat peanut sauce with a spoon…. Loyce, what a dear thing to say. Maybe you could just have a TINY bit of the sauce? Robin and Devany, you both have EXCELLENT taste. Thanks to all for visiting….